Spotify claims Apple blocked its latest iOS app update | What Hi-Fi? Spotify says Apple has blocked its latest app update because the streaming service doesn’t abide by Apple’s in-app billing system rules. 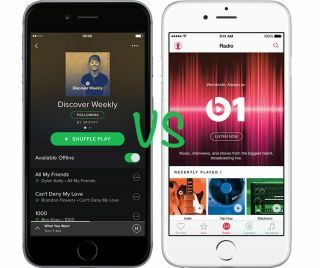 It seems the streaming wars have been kicked up a notch following the news that Apple isn’t allowing Spotify to update its iOS app because of “business model rules”. A letter sent on 26th June from Spotify's lawyer Horacio Gutierrez to his Apple equivalent, Bruce Sewell, was picked up by Recode. “This latest episode raises serious concerns under both US and EU competition law”, it says. This refers to the fact that Apple charges up to 30 per cent for app developers using its billing system. In Spotify’s case, you can sign up for the £10 per month Premium tier through Spotify’s website, then use that Premium account through the iOS app. But if you sign up on the iOS app directly, Spotify charges £13 per month, to make up for Apple’s fee. Lossless quality streaming service Tidal has also abided by the same rules, charging customers £13 per month and £26 per month for its Premium and Hi-Fi tiers when bought directly through the iOS app. Because Spotify wants to remain competitively priced, it has been encouraging users to sign up to the service outside of the App Store. Gutierrez claims Apple threatened to remove the Spotify app entirely from the App Store unless Spotify stopped promoting this way of signing-up to iPhone users. Spotify has since stopped the promotion. The blocking of Spotify's latest update seems to be the latest development in the battle.